Removable, scratch-resistant, rustproof black display deck. 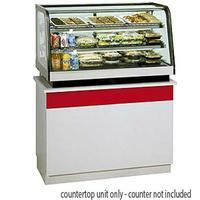 The Signature Series counter top merchandiser combines attractive curved glass styling and merchandising flexibility. Designed for continuous case line-ups. Cases are available in lengths of 3 and 4. Condensate evaporator provided for a totally self-contained system. Oversized coil and low-velocity fan system maintains high humidity and product freshness. Easily accessible light switch and adjustable temperature control. Black painted metal and stainless construction. Black trim. Cord and plug (six foot). Set directly on counter with condensing component mounted on rear. Recessed 3" in the counter with condensing component mounted underneath. view One year parts and labor.